Context: According to a report- ‘The Salary Surge’, India would be the only economy that will not face an upward revision of wages by 2030, as it has a talent surplus, bucking the global trend of a talent crunch. Globally, a shortage of highly skilled employees could dramatically drive up salaries for the most in-demand workers by 2030. This is likely to add more than USD 2.5 trillion in annual labour costs by 2030, for organisations around the world. Globally, US companies can expect to pay the most globally facing a wage premium of more than USD 531 billion by 2030, while Germany will be the worst affected, facing a potential wage premium of approximately USD 176 billion by 2030. Meanwhile, in the Asia Pacific, the salary surge could add more than USD 1 trillion to annual payrolls by 2030, jeopardising companies’ profitability and threatening business models if kept unchecked. The study also found that Japan would be expected to pay the most, an additional USD 468 billion by 2030. The trend shows scarcity in abundance. There are plenty of people, but not enough with the skills their organisations will need to survive. While overall wage increases are just keeping pace with inflation, salaries for in-demand workers will skyrocket if companies choose to compete for the best and brightest on salary alone. In this trend, smaller markets with limited workforces are likely to feel the most pressure and by 2030. At a sector level, manufacturing, a critical driver of growth for emerging economies, may be stalled by the huge impact of the salary surge. 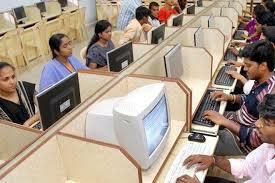 Unlike any other country in the study India will have a highly skilled talent surplus by 2030. For Prelims: Meaning of talent surplus. For Mains: Talent surplus- challenges, issues and solutions by the government. Context: The inaugural U.S.-India 2+2 Dialogue will take place in the month of July. 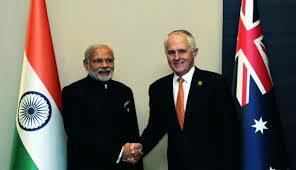 The new dialogue format was agreed to between the two sides during the visit of Prime Minister Narendra Modi to Washington D.C. in June, 2017. The dialogue mechanism includes defence and foreign ministers of the two countries. It replaced India-U.S. Strategic and Commercial Dialogue for trade and commercial issues. The objective of this dialogue mechanism is to raise defence and security issues to the forefront and centre of the relationship between India and the U.S. It is aimed at enhancing peace and stability across the Indo-Pacific region by elevating strategic consultations in the dialogue. The shared priorities include job creation, improving the business and investment climate and sustaining a rules-based global order. The U.S. has strategic consultations in this format with key partners and allies including Australia, Japan and the Philippines. Similarly, India has 2+2 (diplomatic and security) dialogue with Japan. It was launched in 2010. The 2+2 format provides for the annual consultations over a range of overlapping security and political issues between the foreign and defence ministers of both the countries. For Prelims: “2 by 2” Dialogue- meaning and countries with which India has developed this mechanism. For Mains: “2 by 2” Dialogue- need and significance. Context: Eurozone nations have agreed on the final elements of a plan to get Greece out of its eight-year bailout program and make its massive debt more manageable. Greece has been surviving primarily on loans from the eurozone since 2010, when it lost market access to funds because of a ballooning budget deficit, huge public debt and an underperforming economy, matched with an expansive welfare system. Greece’s third bailout is due to end in August. The seeds were sown back in 2001 when Greece adopted the euro as its currency. Greece had been an EU member since 1981 but couldn’t enter the eurozone. Its budget deficit had been too high for the eurozone’s Maastricht Criteria. All went well for the first several years. Like other eurozone countries, Greece benefited from the power of the euro. It lowered interest rates and brought in investment capital and loans. In 2004, Greece announced it had lied to get around the Maastricht Criteria. The EU imposed no sanctions. Post that, Greek debt continued to rise until the crisis erupted in 2009. It is a monetary union of 19 of the 28 European Union (EU) member states which have adopted the euro (€) as their common currency and sole legal tender. The countries in the eurozone as of 2018 are: Austria, Belgium, Cyprus, Estonia, Finland, France, Germany, Greece, Ireland, Italy, Latvia, Lithuania, Luxembourg, Malta, The Netherlands, Portugal, Slovakia, Slovenia and Spain. Annual budget deficits must not exceed 3% of gross domestic product. Public debt must be under 60% of gross domestic product. The country must have exchange rate stability. Inflation rates must be within 1.5% of the three EU countries with the lowest rate. Long-term interest rates must be within 2% of the three lowest interest rates in the EU. For Prelims: Eurozone- features and members. For Mains: Greece crisis- reasons, challenges and efforts by Euro Group. Context: The US side has pressed the Indian side to sign the two foundational agreements for defence cooperation: Communications Compatibility and Security Agreement (COMCASA), earlier known as the Communications and Information Security Memorandum of Agreement (CISMOA); and Basic Exchange and Cooperation Agreement (BECA). India and the US have so far signed only one foundational agreement: Logistical Exchange Memorandum of Agreement (LEMOA). COMCASA is a “technology enabler” to help transfer high-tech avionics, encrypted communication and electronic systems to India as well as ensure secrecy of its C4ISR (command, control, communications, computers, intelligence, surveillance and reconnaissance) systems from leaking to other countries like Russia. This agreement would allow the interoperability of India and United States equipments. BECA refers to Basic Exchange and Cooperation Agreement for Geo-spatial Cooperation. This agreement would facilitate exchange of geospatial information between India and United States for both military and civilian use. COMCASA is needed if any classified military information is required to be exchanged between US and Indian armed forces, and would allow India to fully utilise the communication security equipment on military platforms it imports from the US. Signing COMCASA would help because such advanced technologies and sensitive equipments are generally installed on US procured systems only. This agreement could also be important for multinational operations related to rescue, disaster relief etc. Why is India hesitant to sign these agreements? There are widespread fears that the use of American C4ISR systems could compromise India’s tactical operational security, enabling the US to keep track of Indian warships and aircraft. India has asked the United States for a binding assurance in the Communications Compatibility and Security Agreement (Comcasa) to ensure that the secured communication equipment covered by the pact are available to India and kept operational at all times. Besides availability of equipment at all times, India wants it put down in the agreement that the US will not share data from Indian platforms with another country and nor will it access this data without prior permission. Also, the choice to upgrade would rest with India and not determined by the US. For Prelims: LEMOA, COMCASA and BECA- key features. For Mains: Concerns expressed by India over signing of these agreements, demands by India. Context: The Rural Electrification Corporation has finalised a plan to revitalise stressed power sector assets in a joint venture with the Power Finance Corp and lenders. The plan is named Pariwartan and stands for power asset warehousing and revitalisation. 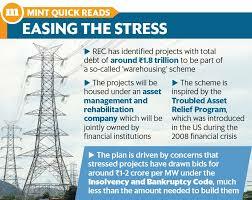 Under the plan, the REC has proposed that a special purpose vehicle, a subsidiary company to securitise assets, be set up with PFC and the lending banks, which would be overlooked by an asset management company. The asset management firm will take on assets with a capacity of about 40,000 MW at net book value, and seek between 4-5% of equity from the National Infrastructure Investment Fund to run power projects under the scheme. The goal of this scheme is to run these power assets to service their current debt, and look at breaking even before the lenders decide to takeover or sell the assets. Most of the assets that would be brought under the scheme face coal supply shortages and suffer from a lack of power purchase agreements. The scheme looks to solve these issues by providing special coal supply assistance with assistance from the coal ministry. Electricity produced during a 48 month period under the plan would also be sold at power exchanges and short term power purchase agreements would be sought from state governments. The ‘Pariwartan’ scheme is inspired by the Troubled Asset Relief Programme, or TARP, which was introduced in the US during the 2008 financial crisis. For Prelims and Mains: Key features of the scheme. Context: The Centre plans to scrap cash incentives currently offered to buyers of electric cars under FAME scheme. The move, experts said, will further dampen sales of private electric cars. The government seeks to withdraw the cash incentives for private electric cars because it neither makes a “substantial difference in promoting sales nor serves the purpose of a clean environment”. Instead, the government has now decided to give cash subsidies to electric vehicles used by shared-mobility operators such as Ola and Uber, as their vehicles will run much more than private cars. The government feels that the addition of cab aggregators like Ola and Uber to the list of subsidy beneficiaries would prompt these companies to go for electrics, which offer highly-lucrative running costs as compared with conventional diesel/petrol or CNG alternatives. Currently, the government offers a discount of up to Rs 1.3 lakh on an electric car as part of its clean-energy programme, FAME (faster adoption and manufacturing of hybrid and electric vehicles). This is being proposed to be removed in the new FAME Phase 2 draft policy drawn up by the heavy industries ministry. The stance runs contrary to the broader mobility vision that the government had projected just a few months back. As pollution rises across many top cities and smog and poisonous gases are difficult to control, the government had said it wants the entire car industry in India to switch to electric by year 2030. Last year, only around 1,500 electric passenger vehicles were sold against petrol/diesel/CNG car sales of 32 lakh. What is it? With an aim to promote eco-friendly vehicles, the government had launched the Faster Adoption and Manufacturing of (Hybrid &) Electric Vehicles in India (FAME-India) scheme in 2015. It was launched by union ministry for heavy industries. Aim: The FAME India Scheme is aimed at incentivising all vehicle segments, including two-wheelers, three wheeler auto, passenger four-wheeler vehicle, light commercial vehicles and buses. The scheme covers hybrid and electric technologies like a strong hybrid, plug-in hybrid and battery electric vehicles. Facts: FAME India – Faster Adoption and Manufacturing of Hybrid and Electric vehicles in India – is a part of the National Electric Mobility Mission Plan. The scheme envisages Rs 795 crore support in the first two fiscals. It is being administered by the Heavy Industries Ministry. For Prelims: FAME scheme and its significance. Topic: Security challenges and their management in border areas; linkages of organized crime with terrorism. Context: The Centre has banned terror organisation al-Qaida in Indian Subcontinent (AQIS) and all its manifestation under the stringent anti-terror law – Unlawful Activities (Prevention) Act. A notification in this regard has been issued by the home ministry. Both al-Qaida in Indian Subcontinent (AQIS) and the Islamic State of Iraq and the Sham-Khorasan (ISIS-K), an Afghanistan-based affiliate of ISIS, have been declared unlawful by the Union home ministry as they were found to be radicalizing Indian youths for ‘global jihad’ and encouraging terror acts on Indian interests. Currently, 39 terror outfits including ISIS, LeT, Jaish and BKI have been banned under the UAPA (Unlawful Activities (Prevention) Act). This law is aimed at effective prevention of unlawful activities associations in India. Its main objective is to make powers available for dealing with activities directed against the integrity and sovereignty of India. The Act makes it a crime to support any secessionist movement or to support claims by a foreign power to what India claims as its territory. The UAPA, framed in 1967, has been amended twice since: first in 2008 and then in 2012. The Act introduces a vague definition of terrorism to encompass a wide range of non-violent political activity, including political protest. It empowers the government to declare an organisation as ‘terrorist’ and ban it. Mere membership of such a proscribed organisation itself becomes a criminal offence. Furthermore, it allows detention without a chargesheet for up to 180 days and police custody can be up to 30 days. It also creates a strong presumption against bail and anticipatory bail is out of the question. It creates a presumption of guilt for terrorism offences merely based on the evidence allegedly seized. In addition, the Act authorises the creation of special courts, with wide discretion to hold in-camera proceedings (closed-door hearings) and use secret witnesses but contains no sunset clause and provisions for mandatory periodic review.